Tuners are rarely objects of desire. Even the best examples of the breed struggle to arouse passions like, say, high end turntables or monster open reels. But Aiwa’s AT-9700 was different – ultra modern in the nineteen seventies sense of the word, it was one of the very first tuners with a digital frequency display. In a world of analogue dial tuners, this seemed the height of technological perfection. Look inside one even today and its build is impressive; the Aiwa is 10kg of discrete transistors, integrated circuits, FETs and diodes and no less than 63 LEDs! Then there’s the wildly over-the-top mains transformer and more case bracing metalwork than your average oil rig. No wonder that at 45cm across, you can only just squeeze it into a standard hi-fi rack. It’s a thoroughly engineered bit of kit, for sure. The front end uses a five gang variable capacitor and two MOSFETs for high sensitivity, and star earthing is used for low noise. Its dual system IF stage has a twelve pole LC filter for high sensitivity, plus a linear phase ceramic filter for optimum selectivity. These are normally selected automatically, but users can manually specify the latter in difficult reception conditions by moving the front panel SELECTIVITY control to SHARP. There’s also a choice of two HI-BLEND settings – good for crowded airwaves but not so great for sound. 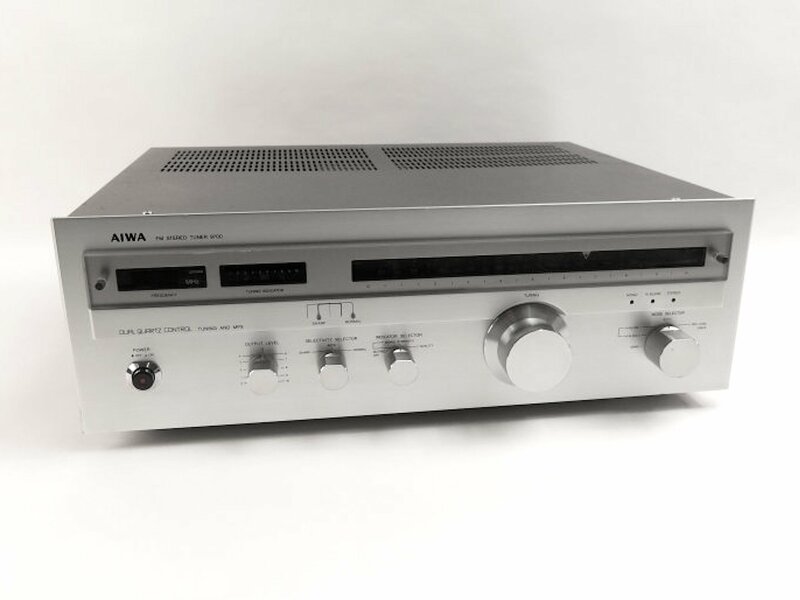 Most tuners of that period were hardly the most beguiling of performers, but the high end Aiwa was unusually clean and uncluttered, lacking the trademark upper midband coarseness of rivals. In truth the sound is still quite a way behind a Leak Troughline for example, but it does have other strengths. Whereas many classic tuners are notoriously insensitive, the AT-9700 can pick anything you care to listen to out of the ether. Its 0.6uV sensitivity means that if you live miles from a transmitter, or in an FM-unfriendly urban environment, it’s the most practical classic wireless on the market. Although quite happy with a piece of wet string, the Aiwa positively motors with a decent twig. Properly set up, its excellent stereo imaging, fine depth perspective, strong confident bass and crisp (if not sweet) treble and highly detailed midband will impress. Thanks to its very high original selling price, the Aiwa AT-9700 isn’t the most common tuner on the used market, but there’s actually more of them around than you’d think and most sell for well south of £150. They’ll never be absolute classics in the mould of the Leak Troughline or Yamaha CT7000, but nor do you have to pay silly prices.